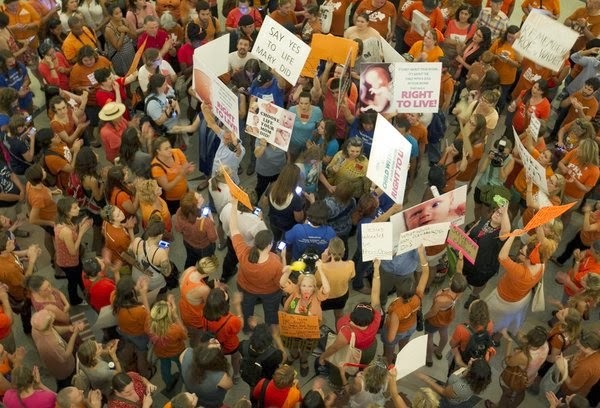 A federal appeals court on Thursday ruled that most of Texas' tough new abortion restrictions can take effect immediately — a decision that means a third of the state's clinics that perform the procedure won't be able to do so starting as soon as Friday. The rule is this: states can make whatever laws they want so long as those laws do not infringe on the Constitutional Rights of the people. And when we say the "Constitutional Rights" of the people, we don't mean the State's interpretation of the Constitution but rather the federal government's interpretation of the Constitution which is handed down to us by none other than the United States Supreme Court. That being said, one may wonder what the current Constitional rule is regarding abortion because it seems to be a topic that has picked up momentum lately in several state legislatures. Before we get to this latest ruling in Texas let's just take a moment to review the current rule on abortion. In 1973, the Supreme Court ruled 7-2 that abortion is legal in all 50 states in the landmark case Roe v. Wade. But the Court did not grant an absolute right to abortion. Instead they ruled that a woman's constitutional right to an abortion has to be balanced against the state's right to protect the health of the mother and the health of the child. In order to achieve this balance, the Court came up with a trimester framework that essentially created an absolute right for a woman to seek an abortion within the first trimester but gradually transferred that right from the woman to the States as the pregnancy approached the third trimester. In 1992, with many people expecting the overruling of Roe v. Wade, Supreme Court Justice Sandra Day O'Connor, a Republican, shocked many people in the legal and political communities by authoring the Supreme Court's ruling in Planned Parenthood v. Casey which effectively doubled down on the proposition that abortion is legal in all 50 states. However, in that case the Court tossed out the whole trimester framework of Roe v. Wade and adopted a simpler yet somewhat more confusing rule which is the current rule on abortion today: the "Undue Burden" rule. The "Undue Burden" rule basically says that the states are free to pass laws regulating abortion as they see fit so long as those laws do not create an "undue burden" for a woman to access her Constitutional Right to an abortion. What is and what isn't an "undue burden" is a matter of legal interpretation left up to the federal courts, which brings us back full circle to this week's ruling in Texas. A federal judge in Texas on Monday blocked an important part of the state’s restrictive new abortion law, which would have required doctors performing the procedure to have admitting privileges at a nearby hospital. The decision, one day before the provision was to take effect, prevented a major disruption of abortion clinics in Texas. It was a victory for abortion rights groups and clinics that had said the measure served no medical purpose and could force as many as one-third of the state’s 36 abortion clinics to close. But the court partly upheld a second measure, requiring doctors to use a particular drug protocol in nonsurgical, medication-induced abortions. Doctors have called that protocol outdated and too restrictive. Gov. Rick Perry, who has said he hopes to make abortion “a thing of the past,”signed the legislation in July. It had been temporarily derailed when Wendy Davis, a Democratic state senator,mounted an 11-hour filibuster in the Republican-controlled Legislature. Ms. Davis is now running for governor, with abortion rights as one of her planks. And that's why this post uses the phrase "1st Round" in the title. Make no mistakes about it folks, this fight is only getting warmed up. Next stop, the 5th Circuit Court of Appeals where Republican-appointed judges outnumber Democratic-appointed judges 10 to 5. Final stop: the Supreme Court. 1. Should a doctor working at their own abortion clinic be required by law to be admitted to practice medicine at a hospital within 30 miles of their clinic? 2. Do you think that abortion should be a constitutionally protected right? 3. Assume for a moment that the states are permitted to outlaw all forms of abortion. Does that create any obligation on the part of the states to provide social programs and/or financial support to the mother and child? 4. Any predictions on how this current Supreme Court will rule on this case?